Series 150 Two Tube Gas Blenders provide a simplified method of metering and blending two different gases into a homogeneous, two component mixture. The blender consists of two Series 150 Flowmeter Tubes, each with separate inlet fittings and metering valves, which control the flow rate of each gas. The ratio of the flow rates of the two gases determines the ratio of the gas mixture. The two gases flow upward through the metering tubes, then down through the mixing tube (located between the two metering tubes)and exiting at the bottom. Two Floats per Tube (Standard) expand range of blender. Ribbed Flow Tubes stabilize floats and improve accuracy and readability. Metal Mixing Tube ensures homogeneous mixing while providing a common outlet port for the gas mixture. Wide Tube Selection allows gases to be blended in a variety of ratios. 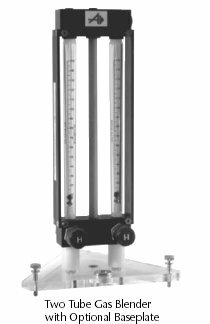 Linear Scale (10-150 mm) allows each blender to be used with a variety of gases via calibration charts. Threaded Fittings with Locking Nuts permit front panel mounting. Unique Valve Design allows bubble-tight shutoff. Baseplate with Leveling Screws permits bench use. Inlet Filters trap foreign matter, extend flowmeter life and reduce maintenance. High Accuracy Valves with Non-Rotating Stems (NRS) allow very fine adjustments to flow settings. Individual Calibration provides ± 1% of full scale accuracy (±2% on tube No.1). * Tubes are supplied standard with borosilicate glass and stainless steel floats. As an option, the glass float may be replaced by sapphire; the stainless steel float may be replaced by either carboloy or tantalum. * * Specify gas, temperature and pressure when ordering a ±1% calibration. A calibration should be ordered for each of the two tubes. Please note the accuracy for tube No.1 is ±2%. Metering Valves 316 Stn. Stl. 316 Stn. Stl. (NRS) Metering Valves 316 Stn. Stl. 316 Stn. Stl. Where "( )" is indicated above, complete the part number by inserting the required tube numbers in the order in which they are to be installed. Select tubes from Tube Selection. Example: FM4620-12, tube no. 1 will be on the left and tube no. 2 on the right. Order by complete part number.